Sid saves the day: Sidney Crosby scored the lone shootout goal, saving Canada from a huge upset at the hands of Switzerland last night in a 3-2 win. It was another memorable moment in the rapidly-expanding universe of Crosby highlights, and this time it prevented a Swiss upset of Canada for the second time in as many Olympics. Switzerland has just two NHL players on their Olympic roster. Crosby was not on the 2006 Canada squad that lost to Switzerland in Turin, and like he usually does, he made his point through actions last night. Because of Sid's heroics, 33 million Canadians can breathe a little easier today, but the Americans will come hungry for their showdown with Canada on Sunday. Martin Brodeur, who allowed two goals on 23 shots, rose to the occasion by stopping all four Swiss shootout attempts. Nonetheless, it was a huge scare for Canada, which continues to struggle with line chemistry despite peppering Swiss goalie Jonas Hiller with 47 shots. Malone, US cruise past Norway: Pittsburgh native Ryan Malone scored his second goal of the Olympics, Brian Rafalski added a late pair, and the US defense held Norway to just 11 shots in a 6-1 win for the Americans. Malone assisted on a first-period goal by Phil Kessel to get the scoring started, and goals by Chris Drury and Patrick Kane stretched the U.S. lead to 3-0 before Norway would get on the board. The lopsided victory is actually beneficial in this style of play, which uses goal differential as a tiebreaker, so the third-period goals by Rafalski and Malone did more than pad a lead. Slovakia sneaks by Russia: Pavol Demitra scored in the seventh round of the shootout, lifting Slovakia to a surprising 2-1 win over Russia late last night. 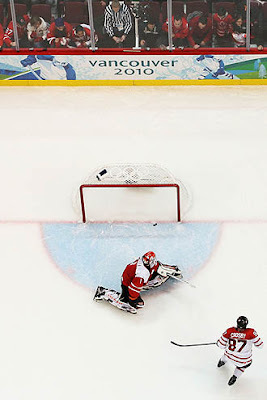 Former Penguin Alexei Morozov's goal for Russia held up until the 9:48 mark of the third period, when another ex-Penguin, Marian Hossa, beat Russian goalie Ilya Bryzgalov to tie the game at one. And don't forget about Pitt: The Panthers weren't sitting around watching Olympic hockey last night, as they were too busy beating Marquette 58-51 at the Bradley Center in Milwaukee, Wisconsin. If you want to talk about balanced attacks, Pitt defined that last night, as Nasir Robinson, Gary McGhee, Brad Wanamaker, and Jermaine Dixon all led the team with 10 points each. Ashton Gibbs' game went MIA, as he was 0-for-6 from the floor and finished with just two points. The Panthers finally got a big contribution from much-heralded and seldom-playing Dante Taylor, who had three uncontested dunks in a span of about two minutes to help Pitt go on a 14-5 run early in the second half. McGhee added a career-best six blocks, and Jermaine Dixon added seven boards to round out the Panther attack. Hey, Penn State won a Big 10 game! Just for Adam the Penn State Fan, here's a quick congrats to the Nittany Lions for raising their conference record to 1-12 with an 81-70 win over Northwestern last night. A Pirate already hurt: We're just days into pitchers and catchers reporting for duty and already reliever Joel Hanrahan is facing an injury. Bo Duke, the General Lee, and Jake Busey coming to the Burgh: And they're not the only ones. Steel City Con, the huge pop culture fest, is going down next weekend at the Monroeville Convention Center. It's billed as the largest toy show in the US. USA looked sluggish for a while in the 3rd, it was nice to see some stat padding late. Canada was in trouble and was honestly luck to escape with a win, but I am glad it was Sid who won it for them. All of the Olympic Coverage here and you didn't mention the Mulletted Russian guy whining about judging in figure skating? It's bad enough the entire world knows you are a male figure skater, why would you do anything to make yourself look like even more of the P-word?! But that's what P-words do, they whine like B-words...those little C-words.